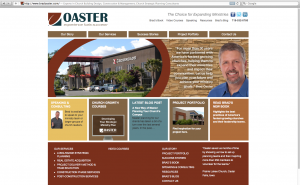 We recently designed a new website for Oaster, a Colorado Springs-based company specializing in church building and expansion. The new website was the culmination of a complete rebranding effort that included a new company logo, color scheme and templates for printed and electronic communications. Growing out of our Marketing Action Plan (MAP) strategic planning and branding process, the entire effort was implemented over just a few months, helping to reinvent Oaster and its brand for greater relevancy to its design-savvy audience.